What the heck have we been doing all summer? Bet that is the number one question that y’all have. Right. Mostly a little of this and a little of that. And very little lounging about. Today and yesterday weren’t exactly lounging about days, but they contained no major chores. All the little ones were easy to accomplish and still have time for reading in the sun. In terms of family time, the summer has been nearly perfect. We’ve all spent enough time together to talk, see and do what we like together, yet not so much time that we get on each other’s nerves- oh, maybe a bit perhaps. We even found time one Friday afternoon, to take a short trip down river a few miles to Hamburg Cove. Being like turtles- no, not slow, but with our home always with us- is great. No worried about what to bring, we just cast off the lines and go. We brought dinner a few times, supplemented with side dishes Benj made. 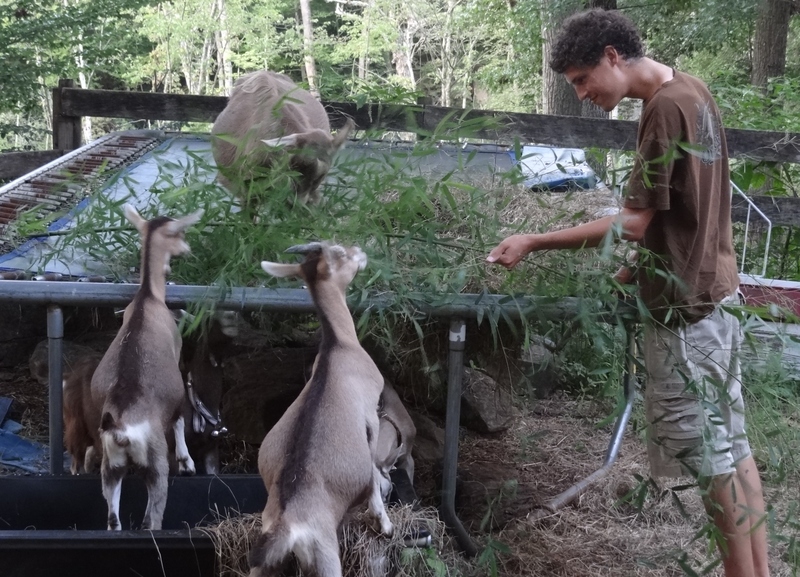 The goat milking operation was fun to watch as Benj showed Sara, his evening helper how to milk the goat. She caught on right away. Sara filled in on weekends when Benj worked the POB and the couple days when Jack and Kerry visited from CA. Laundry; groceries; regular trips to storage, mail store, Defender, West Marine, boat cleaning and fix-it projects seem to consume a huge chunk of our “non-working” time. I thought this summer would find us with fewer projects; not so true. One fairly easy project was to set up a snubber for our bridle. 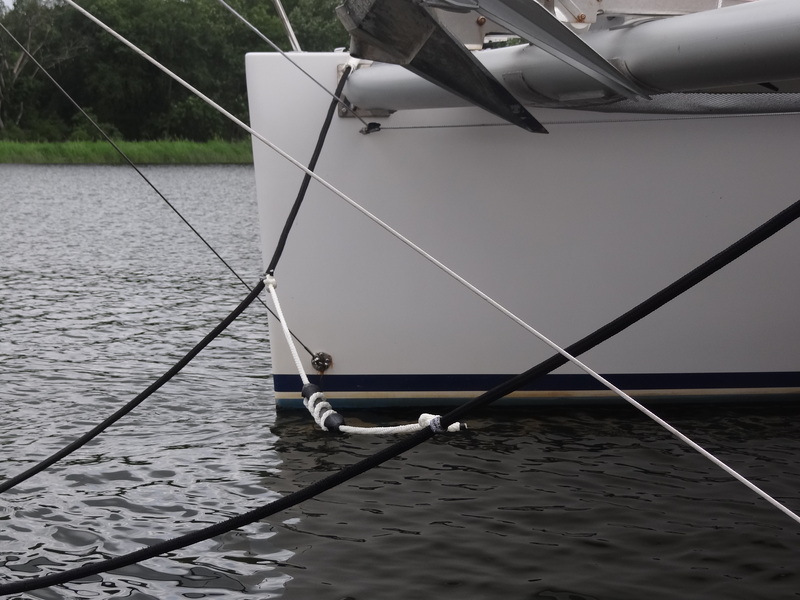 This would provide stretch when anchored in windy conditions, as well as help keep the bridle away from the dolphin strikers. The birds have been active, swooping around carrying and dropping an interesting variety of objects. This year, at least, we didn’t have the sparrows repeatedly trying to build a nest in the end of the boom. The seagulls become active several times a day when they are dining out. One morning Russ pointed to the port bow. What the heck was it? A large slug, a huge bird turd… no it was… eeeu- the tail end section of a snake. Skinned. Pinkish. A one inch piggy-bank coin slot cut lengthwise in its side. We figured it got dropped by a seagull, same as the piece of dead fish we found soon after, on top of the cockpit roof. Food fight!!!! The other day I figured out (sadly) the sound I’d heard about a week ago. 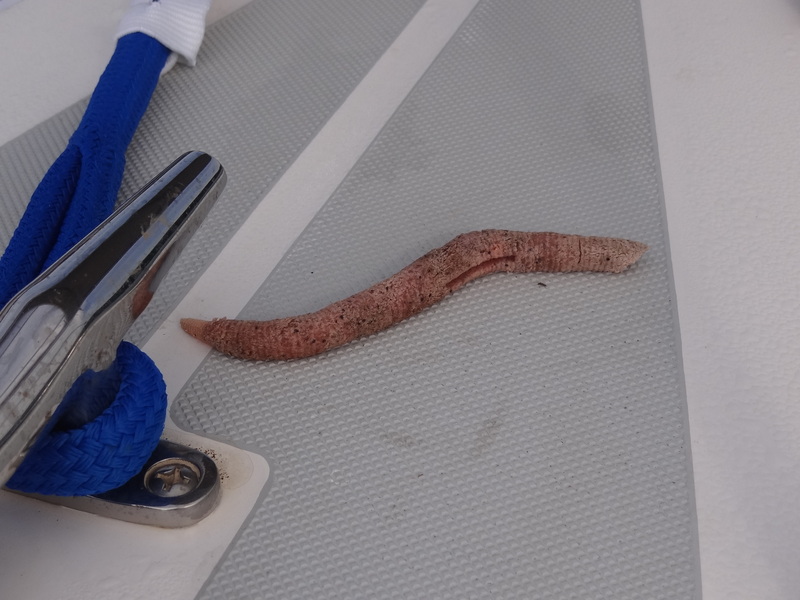 I was reading (maybe I should have been scrubbing the boat) by the stern when I heard this awful, screeching sound; not high-pitched and I wasn’t sure if it was manmade or natural. I looked over toward the island where the swans, ducks, egrets and herons hang out in the marshes; didn’t see anything. Decided it might have been a heron, albeit one in some distress. Fast forward to the other day when I hear the same sound. Grab the binoculars. Ouuu- I see a hawk or osprey flying off with something in its talons. I’ll leave it at that. 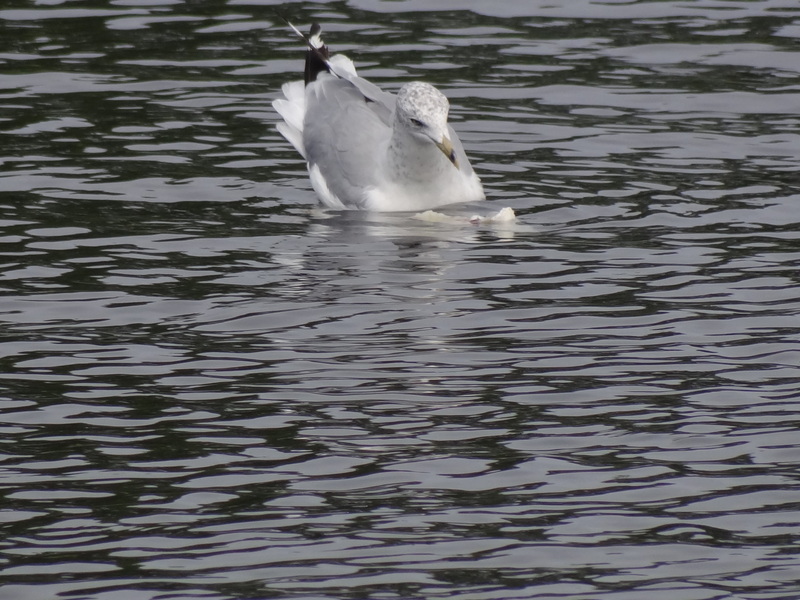 Yesterday I was at my bird watching station (reading at the stern) when the seagulls began screeching; one drops his prize in the water and he and his buddy appear to be indecisive about their next move. Well, the large fish that jump and splash all day (ok, maybe just at eating time) sure knew what to do. In between grabbing the camera, trying to focus and still keeping an eye on the action, I watched as the fish snagged a few bites from below. 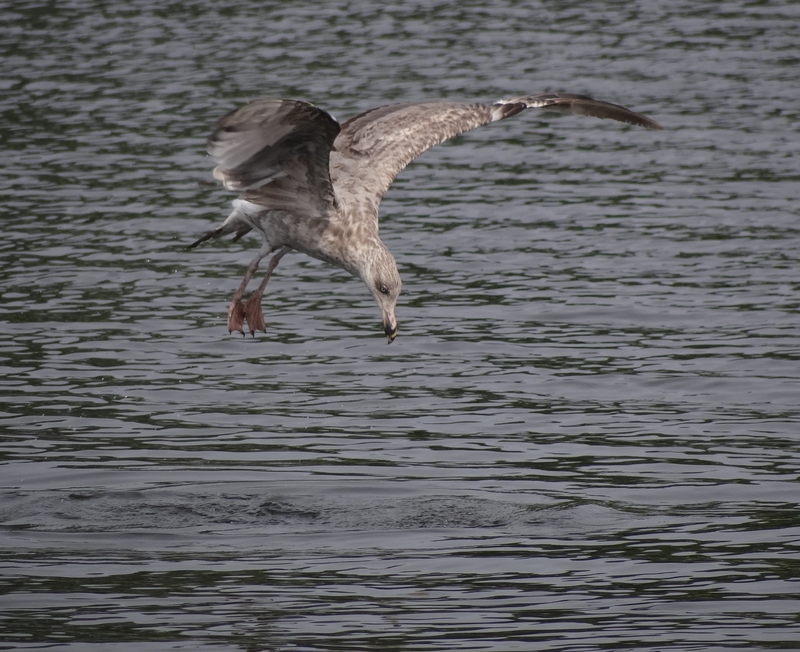 The gull made a valiant effort to get his share, but in the end not much of the fish- or whatever it was, remained for seagull food. 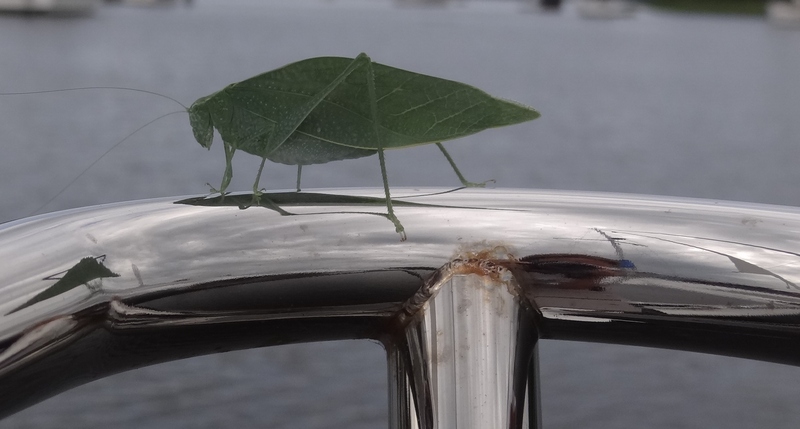 Our dock is easy to live on; friendly, helpful dock neighbors who respect our privacy, much like if we lived in a house. Nearly every night nature provides interesting views; boats and people provide a diversion and all sorts of creatures stop by for a visit.